CUPE 2626 filed a grievance against the university on Jan. 27 alleging violations of the collective agreement articles on discrimination, harassment, discipline and academic freedom. The union decided to drop the grievance in October and in return the university agreed not to place information gathered about CUPE members in their employee files. Joseph Hickey, one of the TAs who called for the grievance, strongly disagreed with the union president. Hickey was barred from University of Ottawa’s grounds on Dec. 7, 2009 following a charge that he had painted on a campus billboard during a freedom of expression demonstration. He was arrested on trespassing charges four days later,­­ when he tried to set up an appointment with university president Allan Rock to discuss his banishment from campus. A month earlier, in an e-mail exchange between André Lalonde, a dean of the university’s faculty of science, and Gary Slater, the university’s dean of postgraduate and doctoral studies, concerns were expressed over Hickey’s political beliefs and his proximity to Professor Rancourt. The e-mail thread was obtained through Ontario’s Freedom of Information Program. “André [Lalonde] does not want to supervise [Hickey] anymore because of his newly acquired activism beliefs,” wrote Slater. Rancourt was fired by the University of Ottawa in 2009 after his teaching methods—he gave an A+ to every student enrolled in one of his classes—garnered national media attention. One of the main accusations Rancourt has leveled against the University of Ottawa is that the university’s legal counsel hired chemistry student Maureen Robinson to spy on student activists and Rancourt himself. Rancourt’s report uses circumstantial evidence in an attempt to tie Robinson—who had criticized one of Rancourt’s courses through campus media—to a covert surveillance operation conducted on behalf of the university’s lawyer, Michelle Flaherty. He also alleged that Robinson created fake Facebook and Gmail accounts to infiltrate and gather information on student activist groups. Robinson denied these allegations as baseless and “pathetic” in a January interview with The Fulcrum, the university’s student newspaper. 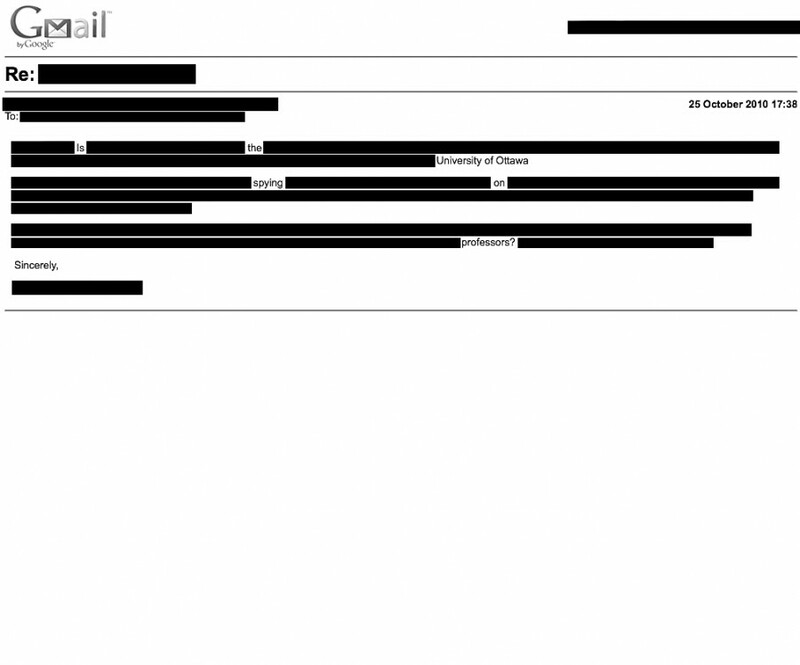 In e-mail correspondence obtained through the Freedom of Information Program, Flaherty and an anonymous “agent of legal counsel” exchanged information about Severin Stojanovic, a student running for a seat in the university’s graduate student union. “Let’s hope [Stajanovic] doesn’t win in next week’s election,” wrote the agent. debate, wrote an e-mail to Rancourt claiming he saw Robinson taking notes on her laptop during Stajanovic’s portion of the debate. In his e-mail to Rancourt, Marchand alleges that, under the alias “Nathalie Page,” Robinson created fake Facebook and e-mail accounts and began joining activist groups. After looking into Page’s Facebook profile, Marchand noticed that Page’s Facebook activity began on Dec. 6, just a few hours before his event. He then described an additional event, which was a picket line organized using Facebook. Page confirmed her attendance on the social networking site. “There were a small number of students at the picket line, all of whom I recognized, none of whom was Nathalie Page. I noticed Maureen Robinson attended,” wrote Marchand. In the e-mail, Abdelhadi wrote that Robinson told a friend she was hired by the university to gather information to discredit Rancourt and his controversial teaching methods. Abdelhadi claimed Robinson was given an office and charged with keeping tabs on student groups supporting Rancourt. She also wrote that Robinson created the “Nathalie Page” Facebook account to gain access to the student activist community. The University of Ottawa has denied claims that they spy on students and faculty members in the past, but could not be reached for comment before press time. No one The Link contacted had ever seen or spoken to Page. Page stopped posting on Facebook in 2008.